Author(s): Donatella Tondi, Simon Cross, Alberto Venturelli, Maria P. Costi, Gabriele Cruciani, Francesca Spyrakis. Department of Life Sciences, University of Modena and Reggio Emilia, Via Campi 183, 41125, Modena, Italy. Nowadays clinical therapy witnesses a challenging bacterial resistance limiting the available armament of antibiotics. Over the decades strains resistant to all antibiotics have been selected while medicinal chemists were not able to develop agents capable of destroying them or to prevent their extension. In particular, carbapenem-resistant Enterobacteriaceae (CRE), representing one of the most common human pathogens, have been reported with increased frequency since their first identification twenty years ago. The enterobacterial carbapenemases differ from the extended spectrum β-lactamases (ESBL) in their ability to hydrolyze β-lactams, cephalosporins and most importantly monobactams and carbapenems. They are progressively spreading throughout the world, therefore leaving no effective β-lactam to cure bacterial infections. 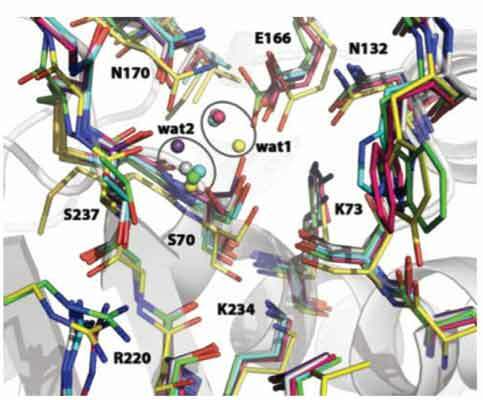 Several BLs-carbapenemase Xray structures have been determined making these enzymes attractive targets for structure-based drug design studies. However, very little has been done so far to powerfully address the inhibitor design issues for this emerging type of BLs. Here, we focus on the structural basis for molecular recognition and for broad spectrum activity of class A carbapenemases: based on available 3-dimensional structural information we identify a theoretical pharmacophoric model as a starting point for the development of needed carbapenemases inhibitors. Keywords: Carbapenemases, guyana extended-spectrum-lactamase (GES), klebsiella pneumoniae carbapenemase (KPC), nonmetallo carbapanemase (NMC), pharmacophore prediction, serratia marcescens (SME), serratia fonticola (SFC1), molecular interaction fields (MIFs). Affiliation:Department of Life Sciences, University of Modena and Reggio Emilia, Via Campi 183, 41125, Modena, Italy. Keywords:Carbapenemases, guyana extended-spectrum-lactamase (GES), klebsiella pneumoniae carbapenemase (KPC), nonmetallo carbapanemase (NMC), pharmacophore prediction, serratia marcescens (SME), serratia fonticola (SFC1), molecular interaction fields (MIFs). Abstract:Nowadays clinical therapy witnesses a challenging bacterial resistance limiting the available armament of antibiotics. Over the decades strains resistant to all antibiotics have been selected while medicinal chemists were not able to develop agents capable of destroying them or to prevent their extension. In particular, carbapenem-resistant Enterobacteriaceae (CRE), representing one of the most common human pathogens, have been reported with increased frequency since their first identification twenty years ago. The enterobacterial carbapenemases differ from the extended spectrum β-lactamases (ESBL) in their ability to hydrolyze β-lactams, cephalosporins and most importantly monobactams and carbapenems. They are progressively spreading throughout the world, therefore leaving no effective β-lactam to cure bacterial infections. Several BLs-carbapenemase Xray structures have been determined making these enzymes attractive targets for structure-based drug design studies. However, very little has been done so far to powerfully address the inhibitor design issues for this emerging type of BLs. Here, we focus on the structural basis for molecular recognition and for broad spectrum activity of class A carbapenemases: based on available 3-dimensional structural information we identify a theoretical pharmacophoric model as a starting point for the development of needed carbapenemases inhibitors.